Nature is my greatest source of inspiration. I like the thought of discovering the beautiful in the small. As I leave my house I immediately find fascinating things to capture with my camera. Could be the scales of a pine cone arranged in interesting rows or a little blue anemone just come into bloom. It’s so amazingly beautiful! When designing my patterns I want to give form to the feeling I got when I took that very picture with my camera. More sources of inspiration for me are Swedish folk art, our traditions and older types of colouring. Often these impressions are interwoven when I create my patterns. For example, a sketch of plants in the wood I can choose to colour in the style of mural paintings from the rustic period of peasant society. By using both new and old techniques and sometimes twist and turn things a little I want to create something new and authentic. I often strive for balance, so that some patterns express energy and growing, others calm and harmony. Or both. 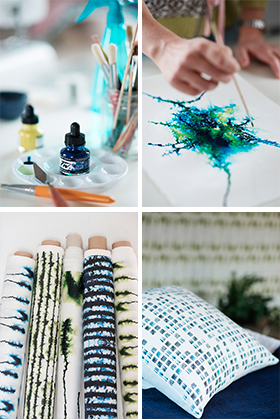 The materials which my patterns are printed on may well connect to nature. Linen and wool are two of my favourites! Sometimes when I want to create something unpredictable and different I am drawn to mixing these materials with other, more colourful ones. This can bring about an interesting collision which further enhances the expression of the product. 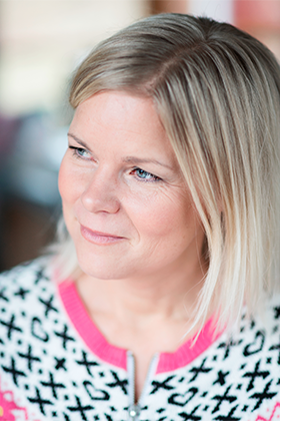 Member of the network Sjutton (Seventeen) where designers, crafters and woodworkers cooperate in putting up exhibitions, workshops, markets etc. 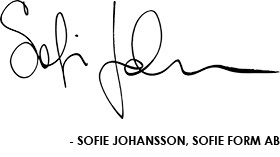 To see more of what is happening in Sofie Form, follow me on Instagram or Facebook. Using my artistic expression I want to deliver pattern design that lifts a company’s existing brand and product range. I want to create a personal and unique design expression in line with the times and which the end consumer can identify with. Seeking competence and maintaining high quality permeate my work. This makes me think on business line and long-term in my productions and customer relations. I strive to work with sustainable materials and to experiment with both old and new techniques, in order to give my patterns a modern feel as well as long durability.